Seven billion litres of water. It’s hard to visualize how much water that is – think of it as the equivalent to a litre of clean water to every single person on the world! And it has made the difference to at least 39,000 people who could have lost their lives to waterborne diseases over the past 10 years. 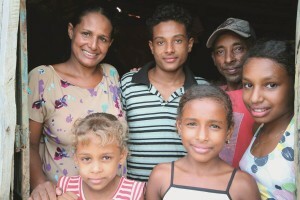 Claudia’s family received CSDW’s 7 billionth litre of clean water. Photo courtesy of P&G. In 2004, one of ChildFund’s partners, Procter & Gamble, started the non-profit Children’s Safe Drinking Water (CSDW) programme, which provides packets of water-purifying powder to families in the Americas, Asia and Africa who don’t have reliable access to clean water. ChildFund has helped distribute the packets to the families in need. The programme is part of P&G’s Clinton Global Initiative pledge to help save one life an hour by 2020, and CSDW estimates that it has already prevented 300 million days of diarrhoeal disease and helped to save over 39,000 lives. Recently, CSDW passed the milestone of delivering its 7 billionth litre of clean water, to a family in one of ChildFund’s programmes in Brazil. 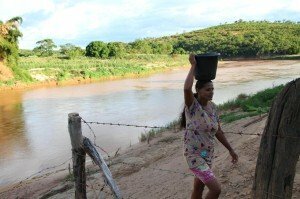 The P&G Purificador de Agua (as the packets are called in Portuguese) is now helping families like Claudia and her husband, Gilberto, and their four children – Wesley, Shirley, Sheila, and Sabrina – in the Jequitinhonha valley region of south-eastern Brazil. Claudia’s family is like many other families in the semi-arid rural areas: they don’t have an adequate permanent water supply, they live on less than USD 3 per day, and they live in a small house with no bathroom. Their main source of water is what they collect in buckets from the local river. Animals also use the river, so the risk of contamination is very high. Claudia knows that the water is dirty and that it might be the cause of many diseases her family gets, but since they have no money to buy bottled water she has no choice but to use it for all purposes in her house: cleaning, bathing, cooking, and drinking. Claudia collecting water from the local river. Photo courtesy of P&G. With the CSDW programme Claudia received packets of water-purifying powder, and participated in the training demonstration to learn how to use it. Now she promises to use the treated water for everything, and she believes that this will improve her family’s health and her children’s development. Claudia’s family is one of nearly 5,000 households the new programme will reach in the state of Minas Gerais. Community volunteers will be trained to carry out education and awareness programmes for 25,000 people so they know how to use the water purification packets and learn about the importance of sanitation and proper hand washing with the intent to reduce waterborne diseases in schools and communities. Just to have an idea of the importance of the programme and how global efforts to address the clean drinking water crisis are having an impact, in 2008 UNICEF and the World Health Organization (WHO) estimated that 4,000 children were dying each day from diseases caused by contaminated drinking water. Today that number is down to 1,600 children – but it’s still 1,600 children too many for a problem that has proven, low –cost and scalable solutions to help address it, like the water-purifying packets. ChildFund believes that clean water is an important step to disrupt poverty. Through the partnership with P&G, ChildFund is helping changing lives not only in Brazil, but in many countries around the world, from drought-affected areas of Kenya to areas impacted by natural disasters in Indonesia and Mozambique.